Lost in this fight is any discussion at all about which students - and which colleges - get these subsidies. Right now, the subsidized loans are available to almost any institution that calls itself a college or university. But what about institutions that provide a substandard education? Or worse, what about institutions that educate people in quackery and pseudoscience? Subsidies to these institutions are worse than useless. These so-called colleges spread misinformation that will require much more investment to correct, if it is even possible. Why, to be specific, is the U.S. government subsidizing students to attend chiropractic colleges? "Improper function of the spine due to slight misalignments—called subluxations—can cause poor health or function, even in areas far removed from the spine and spinal cord itself." "The only thing unique about chiropractic is its basic definition as a method of adjusting vertebral subluxations to restore and maintain health.... The subluxation theory has been the chiropractic profession’s only reason for existence since its inception in 1895." 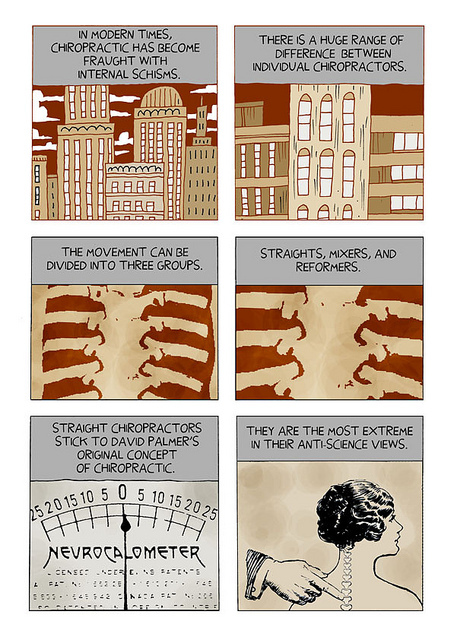 "Numerous deaths have occurred after chiropractic manipulations. The risks of this treatment by far outweigh its benefit." "the presidents of chiro­practic colleges are taking in some of the biggest paychecks in higher education." For example, the president of Logan College of Chiropractic, which has a budget of $24.5 million, earned $791,418 in 2009. That's the same salary earned by the president of CalTech, which has a budget 100 times larger. Low-cost student loans provide a benefit to many students and their universities. But we don't need to subsidize erroneous and misguided colleges that teach their students nonsense. If Congress is going to extend the student loan program, they should take this chance to make the program far more selective. Helping students get a good education helps the country. Lending students money to learn pseudoscience does just the opposite. Petition and article discussing conflict of interest between the banking lobby and students in accrediting high default illegitimate programs. Fight back and sign it. I have been getting allergy shots for about three years (just maintenance now) and have developed a friendly relationship with the nurse who gives the shots (LPN). One day a couple of years ago I asked about her daughter who she had mentioned was “in college”. “What’s she studying?” I asked. “Oh, she’d at Palmer”, the nurse replied. My jaw dropped. I had no idea what to say and could barely bite my tongue. Being a skeptic can make social interaction difficult. Now I have to force myself to ask about the daughter occasionally and nod my head in fake interest. The mother did mention that it has all been accomplished with financial aid. Why is it that civility requires me to not say exactly what I think of this travesty? If the government tried to subsidize medication and drugs, everyone would pitch a fit. I'm outraged that money is being taken away from chiropractic education. Do we all need PSA tests?